Spacious, self-contained, affordable family holiday accommodation by the sea. 1, 2 and 3 bedroom with reverse cycle air-conditioning. Proud to be Pet Friendly. Free Wi Fi , Free carport. Our accommodation is within easy walking distance of walk and bike paths and a short stroll from beautiful Middleton Beach. Our brick and tile chalets have full kitchen facilities with a full sized stove, fridge, microwave, toaster, kettle and all utensils . They have seperate bedrooms and a comfortable living area with Digital TV and DVD players. All linen is included in the tariff and now with reverse cycle air-conditioning! A covered carport at door with room for boat and trailer. Cots, high chair and nursery linen supplied on request, free of charge. Grounds have plenty of space for ball games to be played. Bike hire available. Pet friendly accommodation, pet beds and bowls supplied upon request. Pets are allowed inside but please not in the bedrooms or on the furniture. Our Double chalets are fully self-contained with 2 x bedrooms. Max occupancy 5 - 7 guests. Located only 80 metres from Emu Beach offering an open plan kitchen/living area including all cutlery, crockery and cooking utensils as well as a flat-screen TV/DVD player, FREE WIFI and reverse cycle air-conditioning. Bedding configuration: Bedroom 1): 1 x queen bed. Bedroom 2): 1 x double bed & 1 x single bed. Some chalets have a double sofa. Price is for 2 people only, an extra $25 pp per night for additional guests. Children under the age of 2 stay free with cots, nursery linen and high chairs available on request. 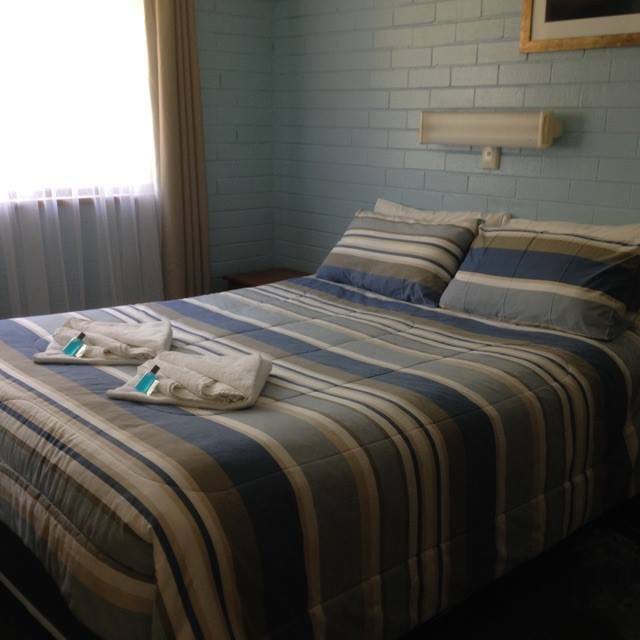 Our 1 bedroom chalet is fully self contained, located only 80 metres from Emu Beach. Max occupancy 2 to 4 guests. Open plan kitchen/living area equipped with crockery, cutlery & cookware as well as a flat-screen TV/DVD player, FREE WIFI and reverse cycle air-conditioning. Bedding configuration: Bedroom 1): 1 x queen bed. Living area): 1 x double sofa bed. Price is for 2 people only, an extra $25 pp per night for additional people. Children under 2 are free with cots, nursery linen and highchairs available on request. Only 80 metres from Emu Beach our 3 Bedroom fully self contained Chalet sleeps a max occupancy of 10 to 12 guests. Open plan kitchen/living area including all cutlery, crockery and cookware as well as a flat-screen TV/DVD player, FREE WIFI and reverse cycle air-conditioning. The bathroom features a shower over bath as well as an extra out-door en-suite. Great for large families or groups with a deck and BBQ area. Bedding configuration: Bedroom 1): 1 x queen bed. Bedroom 2): 1 x queen bed. Bedroom 3): 2 x single beds & 2 x sets of single bunks. Living area): 1 x double sofa. Price is for a minimum of 4 people. Extra $ 25 pp for additional people applies. Children under 2 are free. Cots, High chairs and nursery linen free, available upon request. REFUND OF HALF DEPOSIT WILL OCCUR IF CANCELLATION IS MADE TWO WEEKS PRIOR TO INTENDED STAY. A CANCELLATION FEE OF ONE DAYS RATE APPLIES DURING PEAK HOLIDAY PERIODS. In addition there will be a $62 Albany Visitor Centre cancellation fee.